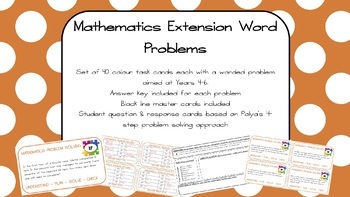 Contained in this set are 40 Mathematics Extension Word Problems aimed at Years 4-6. Each question is unique and requires students to draw on, and combine, knowledge from different areas of mathematics including: place value, number, financial mathematics, decimals, fractions, algebra, geometry, measurement, time and probability. Accompanying the cards is an answer key so that students are able to monitor their own progress independent of the teacher. In addition to the colour class set of word problems, each question is also available on a black and white student response card which follows George Polya’s 4 step problem solving method. 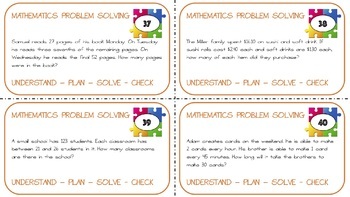 Each card also lists potential problem solving strategies to assist students in approaching the problem. ACMNA123 Select and apply efficient mental and written strategies and appropriate digital technologies to solve problems involving all four operations with whole numbers. ACMNA127 Find a simple fraction of a quantity where the result is a whole number, with and without digital technologies. ACMNA132 Investigate and calculate percentage discounts of 10%, 25% and 50% on sale items, with and without digital technologies. CCSS.MATH.CONTENT.4.OA.A.3: Solve multistep word problems posed with whole numbers and having whole-number answers using the four operations, including problems in which remainders must be interpreted. Represent these problems using equations with a letter standing for the unknown quantity. Assess the reasonableness of answers using mental computation and estimation strategies including rounding. CCSS.MATH.CONTENT.5.MD.A.1: Convert among different-sized standard measurement units within a given measurement system (e.g., convert 5 cm to 0.05 m), and use these conversions in solving multi-step, real world problems. 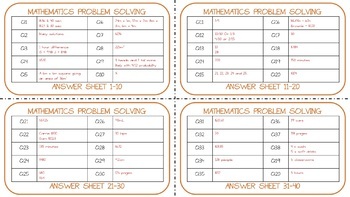 Set of 40 colour task cards each with a worded problem aimed at Years 4-6. 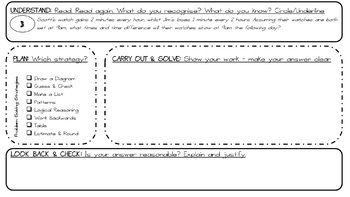 Student question & response cards based on Polya’s 4-step problem solving approach.